This has been an ongoing collection since I was in college and would find these guys at the Waldo Flea Market north of Gainesville. As a kid I had a huge collection of the Kenner Star Wars figures, as most kids my age did. I had the Creature Cantina. Some misc Hoth sets. AT-AT, AT-STs and tons of misc ships. Landspeeder was my first and I still have that one. The rest my mom took into her classrooms over the years (K-1 teacher) for the kiddies to destroy during their breaks and play time. So all my original collection was destroyed by kindergarteners. I didn't care at the time, I was into skateboarding and onto other things. Until I began running into them at the flea market while in college... "I used to have that guy..." and I'd impulse buy a sun-yellowed stormtrooper for 50c. I started finding better and better ones, though, and some vendors knew what they were and priced them a little higher. But all were very cheap back then, comparatively. I went to a couple toy shows and bought some. I would grab them at yard sales, flea markets, etc. I'd bag the figures, and most in bags have the accessories, but a few with X's on the bags do not. Then not long after college my interests drifted and I got bored with it and put them all away. I ran across a couple of original droids at the flea market awhile back in a group of other toys ( the medic w/ all the little white arms and the box w/ legs) and it rekindled my desire to put the entire original collection of complete figures together. After surveying and laying out everything, I think I'm about 2/3 of the way there... but the last 1/3 has the rarer and tougher to find and higher priced ones. We dropped into that ACME toy store in Orlando and their prices on complete figures was nuts. I may bring my doubles into trade. Does anyone on here have any I'm missing they'd like to trade/sell? Anyone ever attempted this crazy task before? Looks like I have a double of Greedo, Obi Wan, Hammerhead, Snaggletooth, ATAT driver, Chewbacca, and maybe a few others. I'm missing the staff or whatever the Bib Fortuna guy had. That is pretty crazy! Unfortunately I can't help you. Maybe Stern will release a Star Wars pin when the new movies come out? You could fill that baby up with action figures! You are smart to stick to the original sets, that is where the true value is. When the prequels and their figures came out every ding dong bought multiples thinking they would become equally as valuable, but there are bazillions out there and when people call the comic store I work at offering to sell them we pass. When people are LOOKING for SW figs I send them to ACME, because they pretty much have everything. You will PAY for it, because they dedicate all that square footage (rent) to figs and things that don't sell that quick. But that's their 'wow' factor. You would be best to do your trading now because when the new movies hit those originals will make a jump in price, and they will be looking for cash sales as opposed to trades. Lots of non-collectors with money pop into collectable stores on impulse when they see things on TV. I've been watching a few ebay auctions, but in those lots of figures there are usually many that I already have. That's going to be one of the problems with ebay, moving forward. And if you don't buy the figures in lots, then you pay double/triple. And apparently this Yak Face, who I don't ever remember existing, is the break the bank figure. And the last 17 (what kid was buying Star Wars figures in 1985/6?? It was deader than dead) are stupid prices. Most all the others I'm missing are cheapish. OK, little update for those interested. I'm 99% there. I think I made a mistake on one Ewok, and have doubles of Warok (but still not sure...diff color bows, but quiver on same side...confusing). I'm missing Bib Fortuna's staff, and waiting for a loose one to pop up on RebelScum or the vintage group. And I do not own a Vinyl Cape Jawa, and will not purchase one because 1) I don't remember him even existing when I was a kid and 2) he commands ridiculous prices and 3) he's the inferior version to the cloth caped Jawa that everyone remembers. So apart from those qualifications, I've COMPLETED THE SET! 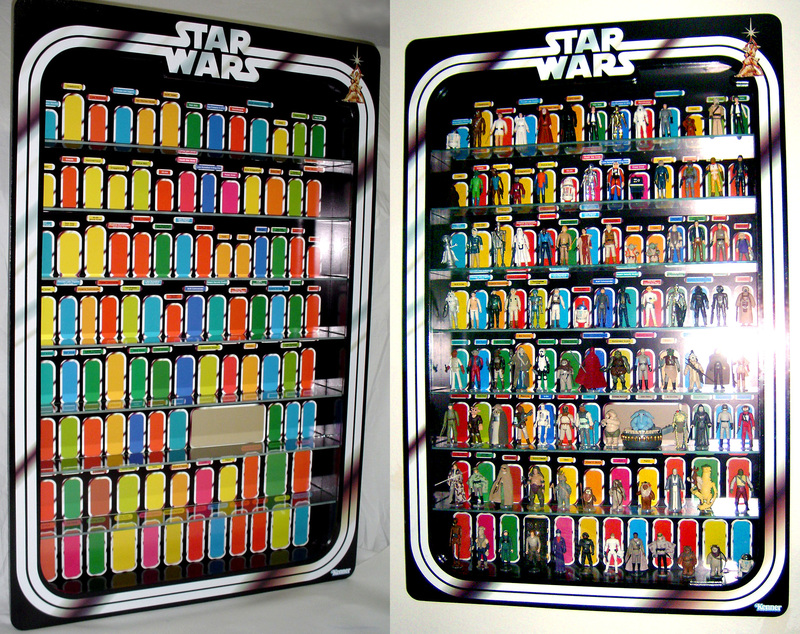 93 original Star Wars figures, all original with all original accessories. General Lando (photo attached) was the last one I needed, and found a great deal on an absolutely pristine example (so glad I waited for the right one, and cheaper than most beat-up ones on ebay!). I even broke down and got the blue Snaggletooth (I never owned him as a kid, but a friend did....a Sears exclusive, and always jelly of his taller Snaggletooth!). Also found Jabba's band, and added that as well, even though that's another gray area needed for completeness. Advice for anyone looking to complete this set. Stay AWAY from eBay!! eBay is not only rife with fakes, repros, and generally lower quality stuff, but the prices are astronomical!! RebelScum forums are awesome. That forum is serious, no-nonsense, and run like a tight ship. Collectors sell to other collectors at very fair discounted prices...BUT if you turn around and throw it on eBay (even next year) they will remember, and you'll not be buying anything else there, and will probably be banned! LOL I love it. Perfect way to weed out the true collectors from the opportunists disguised as collectors (yep, we're all familiar with those characters in the arcade collecting community, and they apparently exist in every collecting community!). But those two sources, RebelScum and Vintage Star Wars on facebook, are tops. Those guys can spot a repro a mile away, smell out a re-card, and a small core of them are the absolute authority on SW collecting. The AFA, which *was* considered the authority, has recently been outed as authorizing many, many fakes which are still floating in the community. So even buying AFA is not safe, and definitely not on ebay (a RebelScum member was just found to have been eBaying a known AFA graded fake, and has been banned...even though some poor sap on eBay just paid $1000 for an absolute fake Boba Fett recard, which was graded and sealed by the AFA! LOL). I can't stress enough...stay away from eBay and AFA graded crap! And do not listen to that insane Jordan on Toy Hunter because he is absolutely out of his rocker when quoting prices (trying to be outlandish for TV and get people talking, but losing any and all credibility as a serious Star Wars authority with every show he airs! Thursday's show he says he has a collector ready to buy a Chewie 12-back for $6500....ROFLMAO. In perfect condition, Chewie's a $500-1000 mint on card 12-back. On a great day! LOL Jordan became a running joke in the community with this week's show! Anyway, it's been fun the past few months collecting these guys and completing the set. I'm going to box them all up carefully, and wait to build a display until we move into a new place. I really love the display these guys build, and this will probably be the one I choose.... I'd like to go to a big toy show this year, just to maybe pickup a nice carded figure that I can examine in person (maybe an original Luke 12-back or Boba Fett 42-back, both of which have childhood stories behind them for me). Not sure what to say except wow and congratulations! I'd love to check out the collection the next time I come up there. That display case is freaking awesome. How much will that cost you? I'd love a copy of that art file, haha, and I bet I could make the whole thing myself with a local printer for under $200.... He designed it, though, so I'll order it from him and put the LED lighting in myself. Oh, and I will have to find another Yoda brown snake variant since he apparently needed to add a variant to make the display even and proportionate. I think I read somewhere that Yoda was his favorite character. It's the best display I've seen. nice I'm a toy addict. I have some old packaged Porsche 911 hot wheels and collect mistake packaging and odd toys here and there. it's a rough hobby to say the least. Oh man, I had a ton of old Matchbox cars I saved from the curb on a rental cleanout a couple years ago. I sold them all on ebay in lots to help fund my vintage Kenner run... which is about 1/3 complete. I've gotten all the really important ones I wanted, the ones I remember opening, and over the past year the prices have gotten silly, so I've put that collection on hold until the hype dies down in about a year. Prices on the vintage Kenner line have gone through huge surges in the past. Leading up to the re-releases and before the pre-quels, the prices for that 1.5-2 year period were roughly where they are now! Then they dropped to maybe 1/5 of that after the last prequel til about 2.5 years ago. The past 2 years have been an exponential rise in prices, so it's definitely time to (either sell or) chillax and wait. And yeah, I also collect the Marvel Secret Wars line, Flash Gordon, MOTU, a few Mego, and Buck Rogers to a lesser degree. Basically the stuff I remember fondly from my youth of late 70's thru mid-80s.